I‘ve always had suspicions that She Who Must Be Obeyed was more than she seemed. I first noticed it at the 2000 Toy Fair in New York, where we both had our photos taken in a Sanrio instant photo sticker booth. The end product was a 4 by 5 inch sheet of little stickers of our faces, surrounded by Sanrio cartoon borders: mine was Badtz-Maru, hers was Hello Kitty. The size of the stickers and the lo-res quality of the camera and printing blew out most of the detail on her face, leaving just the shape of her head, her hair, smile, and glasses, not unlike what you see pictured above. 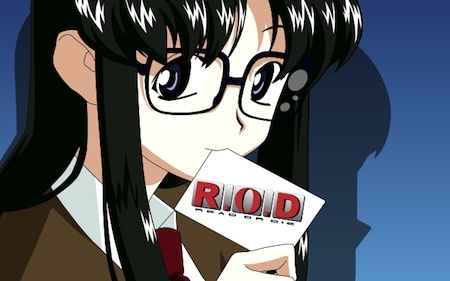 While watching Read or Die (both the anime series and the movie), I noted her resemblance to the main character, Yomiko Readman. It didn’t hurt that she was a book fanatic. He Who’s reaction was “Mom, that’s you!” Now even my son could see it. This entry was posted in home and tagged Diane, home. Bookmark the permalink. Does this make you her Peppermint Patty? And no, because Marcie was in love with Charlie Brown. I think this is really sweet.